Hiroshige drew the fall in Mamasan Guhoji Temple and this temple was also introduced in Edo Meisho Zue, a guide book introducing landmarks in Edo. 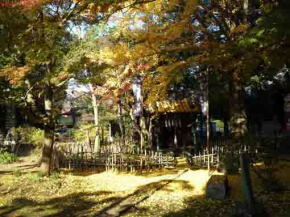 It is a very popular place among the people. 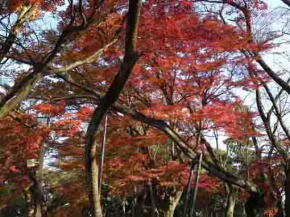 Mitokomon, Issa Kobayashi and thousands of people in Edo visited to enjoy seeing flamingly colored autumnal leaves in it. 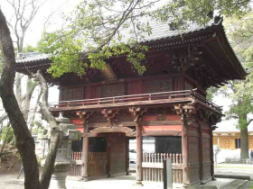 And also many poets such as Shiki Masaoka, Hakushu Kitahara and so on has been visited and written some poems describing the temple. 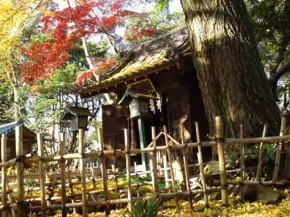 Why don't you visit Mamasan Guhoji Temple in fall? 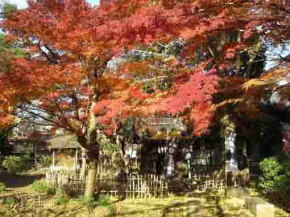 Flamingly colored autumnal leaves in Mamasan Guhoji Temple were loved by people living in Edo during Edo period. The excellent autumnal leaves still exist. 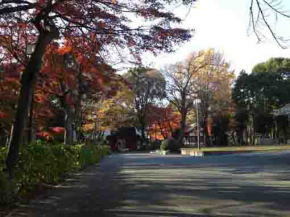 Autumn comes modestly now. 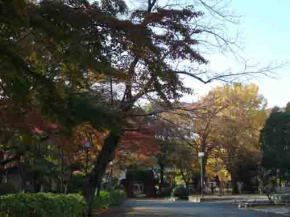 The Niomon Gate and the bell tower are covered with the colored leaves, and the garuden behind the Akamon Gate, buildings and leaves harmonize and create an autumnal wonderland. 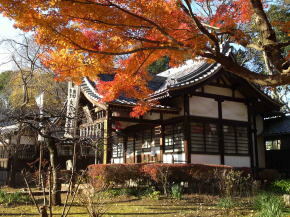 Satomi Ryujindo and Daikokudo Hall are lit up with splendid colored autumnal leaves. 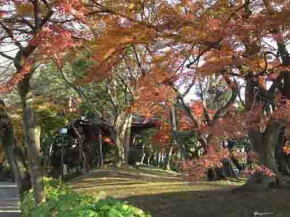 Mamasan Guhoji Temple stands on the central part of the area of Myriad Leaves. Many poets have sang Mama since the age of Myriad Leaves. There are three tablets with haikus written by Issa Kobayashi, Shuoshi Mizuhara and Fusei Tomiyasu on them. 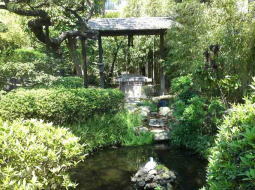 Shiki Masaoka, Hakushu Kitahara who once lived in Mama and Sachio Ito wrote some poems sang Mamasan Guhoji Temple. 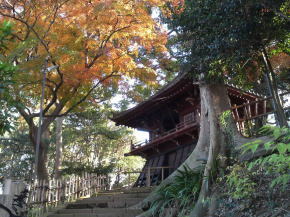 According to Edo Meisho Zue, Edojo Castle could be seen from Mamasan Guhoji Temple, and also Rohan Koda wrote 'it is good to see from under the stone steps of Mamasan to the Niomon Gate, it is better to see from the top of the steps…'. 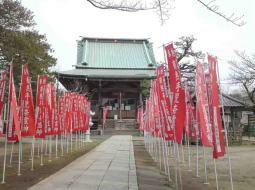 Now there are many tall buildings near the temple, it is enough to enjoy seeing around near it such in Ichikawa City. 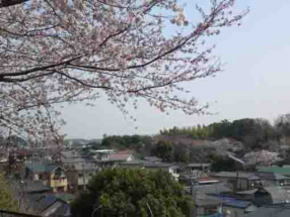 Cherry blossoms in Suwada Park in Spring seen from Mamasan is very beautiful. Isssa Kobyashi was a haiku poet in late Edo period, and his name was Nobuyuki, and commonly known as Yataro, he was a son of a farmer in Shinano province. When he was 3 years old, he lost his mother, and he was on bad terms with his stepmother who came to his house when he was 8 years old. 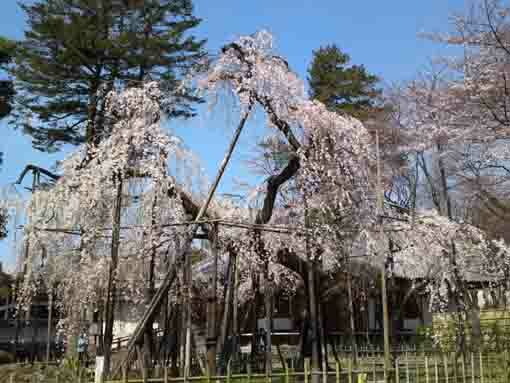 He went to Edo (Tokyo) in spring at the age of 14,and he learned haiku poetry at Nirokuan Chikua in Katsushikaha group. Later he traveled to many parts of Japna. And finally he settled in his home town. In 1801, his father passed at hi sage 39, he had a dispute about an inheritance with his stepmother. In 1827, he suffered a fire so he lived in a storehouse and he died with palsy. He had been in adversity since his childhood, 'Ware to kite asobeya oya no nai suzume', he wrote this poem remembering his childhood. He created his style to using colloquial words and dialects based on his warped feelings in his miserable life. Works: 旅拾遺 Tabi Shui（1795）, 父の終焉日記 Chichi no suen nikki / The Diary fo the Death of My Father（1801）, 三韓人 San Kan Jin（1814）, 七番日記 Shichi ban nikki / The Seventh Diary（1810～1818）, おらが春 Ora ga haru / My Spring, etc. Shuoshi Mizuhara was a haiku poet and a doctor graduated from the facility of medicine at University of Tokyo from Kanda in Tokyo. His real name is Yutaka Mizuhara. He managed his own obsterican clinic and worked at Showa University as a professor in 1928, and worked at Imperial Household Agency as a doctore in 1932. 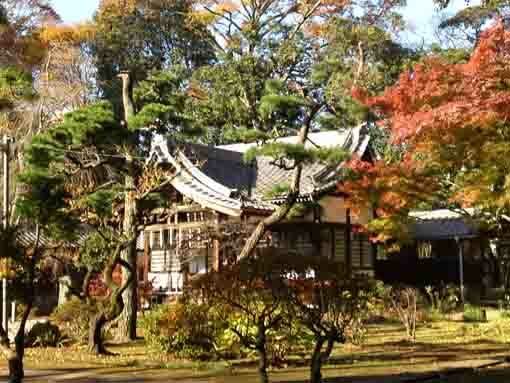 In 1922, he supported to revive the Haiku Association of Tokyo University with Fusei Tomiyasu. 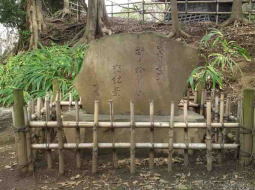 He studied under Kyoshi Takahama and he distinguished himself so he built up the golden age called '4 S Jidai (Ages) of Hototogisu (Cuckoo)' with Seiho Awano, Seishi Yamaguchi, Suju Takano. However, he left the school as he was opposed to Kyoshi's sketchy expression band Suju's detailed expression. 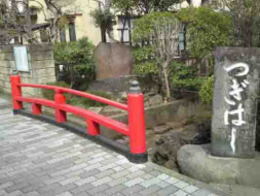 He edited a haiku magazine 'Ashibi (andromeda)' to promote new trend of haiku poetry and he trained several splendid poets like Hakyo Ishida and Shuson Kato. 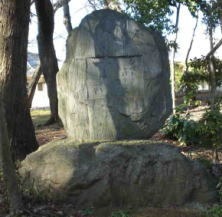 He won the Japan Art Academy Prize in 1964, and he appointed the member of the Japan Art Academy in 1966. Now Shuoshi Mizuhara used to visit Mama and Konodai in Ichikawa city several times in his school days. 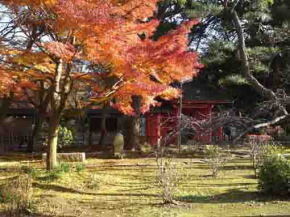 Fusei Tomiyasu is a haiku poet from Aichi prefecture. His real name is Kenji Tomiyasu. He was graduated from the school of law and worked at Ministry of Communications and Transportation and he finally became the vice minister of it. Fusei Tomiyasu wrote some poems with Zenjido Yoshioka, and he supported to revive the Haiku Association of Tokyo University with Shuoshi Mizuhara in 1922. e studied under Kyoshi Takahama and joined to Hototogisu (Kukoo). 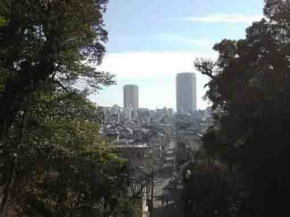 He won the Japan Art Academy Prize in 1971, and he appointed the member of the Japan Art Academy in 1975. 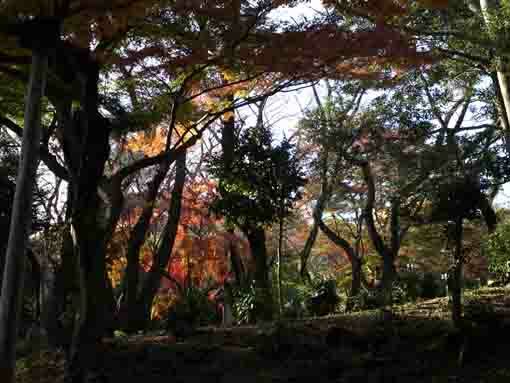 He edited a haiku magazine 'Wakaba' and trained young poets. 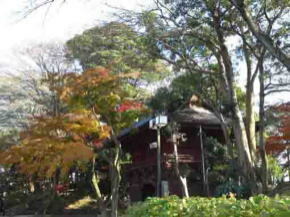 Fusei Tomiyasu often visit Mamasan Guhoji Temple to write haiku poems. 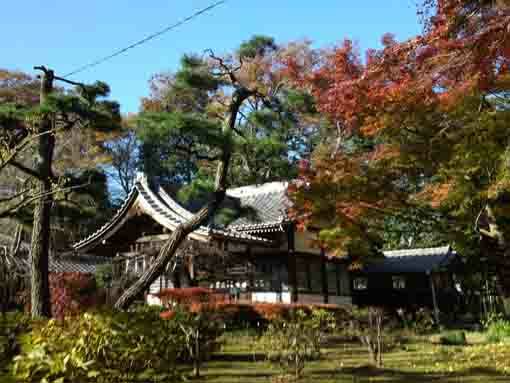 Mamasan Guhoji Temple has great accessibilities from both Narita and Haneda International Airport.